The Essental Site Skills team receiving their award from Olympic legend Kriss Akabusi. 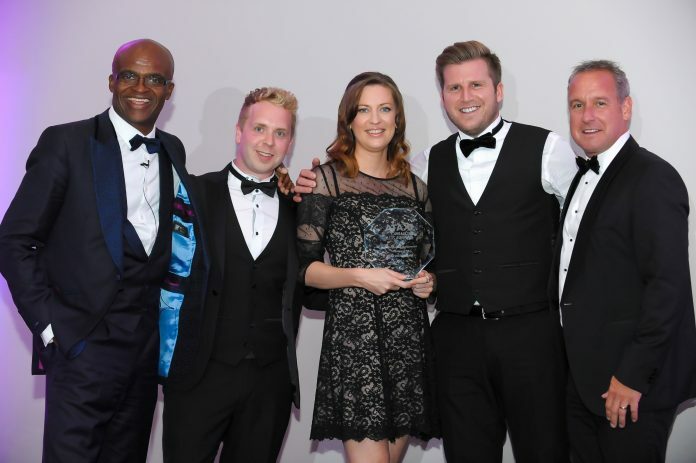 A Nottingham company’s commitment to raising awareness of the killer building material asbestos, has seen it receive the Best Advertising Campaign Award at the recent UK Asbestos Training Association (UKATA) Excellence Awards. The award was presented to Essential Site Skills, based in Eastwood, by Olympic sporting legend Kriss Akabusi at the glittering award ceremony held to mark the association’s tenth anniversary. Essential Site Skills, which was founded by Gareth Davies, Catherine Storer and Stuart Goodman five years ago, was recognised by UKATA for its free asbestos training programmes it delivers to small contractors each year through the Working Well Together initiative. Gareth personally donates five days of his time each year as well as booking and paying for venues and refreshments to run free one-day workshops to help small contractors understand how to work safely with asbestos. Working Well Together is a construction industry initiative designed to help make construction workers more aware of health and safety and safe working practices. Delighted to win the award, Gareth explained: “It was fantastic to win the award and be recognised for what we are doing in the industry, especially by UKATA as it is a respected industry awarding body. Once a professional footballer with Chesterfield FC, injury saw Gareth change career in 2007 to become a bricklayer in a family run construction business. It was his experience working in the industry that inspired him to set up Essential Site Skills. The company now has offices in Nottingham and Newbury. The awards were open to all UKATA member companies. In addition to Best Advertising Campaign, the awards recognised the best in Corporate Social Responsibility, customer service, workforce development, training initiative and innovation. Essential Site Skills was praised by UKATA judges for its company-wide commitment to raising awareness of the dangers of asbestos and providing free training to help small contractors stay safe when working with the hazardous material.